1. Power on/off: Unlock the bottom cover button and put two 18650 cells into the battery body. Press the fire button 5 times in quick succession to turn the device on and off. 4. Micro USB Port function: The USB port can be used for charging and upgrading firmware, it is better to take out the cells and charge them through external charger. Press the fire button 3 times to enter into the mode options. Then press the right regulatory button to switch between VW/TC (Ni, Ti, SS)/TCR (M1, M2, M3) mode. Press the fire button to confirm. Under TC/TCR mode, while the mode sign flashing, press the left regulatory button to enter into its submenu. Then press the right regulatory button to choose TC-Ni/Ti/SS (TC mode) or M1/M2/M3 (TCR mode). Press the fire button to confirm. In this mode, output wattage can be adjusted from 1W to 228W by pressing the regulatory buttons, right to increase and left to decrease. (2). Press the fire button to confirm the mode you chosen. (4). Keep pressing the fire button or leave the interface for about 10seconds to confirm. 1. The TCR value in the sheet is 105 multiplied of the actual TCR. Temperature adjustment: In TC modes, the temperature can be adjusted from (100-315℃ or 200-600℉ ) with the two regulatory buttons, right to increase and left to decrease. Shift between ℃ and ℉: If you increase the temperature to 315℃, and continue to pree the right regulatory button, the temperature readings will automatically change to the lowest Fahrenheit (200℉). Equally, If the temperature is decreased below the minimum (100℃), the unit will change back to ℉ automatically, and the temperature will start to decrease from 600℉. Wattage adjustment: While the wattage sign blink, press the right or left regulatory button adjust the wattage, and press fire button to confirm. Long pressing the right or left regulatory button will make the wattage setting rapidly increase or decrease. 1. 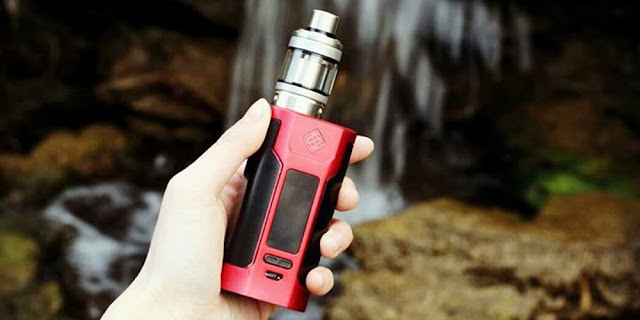 When you connect a new atomizer or disconnect and reconnect your existing atomizer, the device will prompt you to confirm this change and a message will prompt “NEW COIL RIGHT, SAME COIL LEFT”. Press the right regulatory button to confirm that a new atomizer has been attached. Press the left regulatory button to confirm that the same atomizer has been reconnected. 2. When using normal coil or the resistance of coil you used is higher than 1.5ohm in TC modes, the device will automatically switch to VW mode. When powered on, press the fire button and right regulatory button simultaneously and then you enter into the Logo Mode, Press the left regulatory button to choose between logo “ON” and “OFF”, and press the fire button to confirm. 1. Function of charging mobile phone: Connect the RC adapter with mobile phone through USB cable. When the device is on, press the fire button once to start charging. (1). While the device is on, keep pressing the fire button and right regulatory button simultaneously, and then you enter into the sub menu. (2). Press the right regulatory button two times to enter into the USB CHARGE item. (3). Make sure the USB CHARGE is on. (4). Press the fire button three times to switch to USB charging mode. (5). When it is fully charged, the OLED screen will display USB CHARGE STOP. Atomizer Short-circuit Protection: When atomizer short-circuit occurs, the OLED Screen will display “ATOMIZER SHORT”. Weak Battery Alert: In VW/TC mode, when the device installed with an atomizer is working and the voltage of battery is below 2.9V, the device shows “WEAK BATTERY”. Meanwhile, the output power will be reduced accordingly. Lower Power Alert: If the power of battery is lower than 10%, the power symbol on the screen will flash. 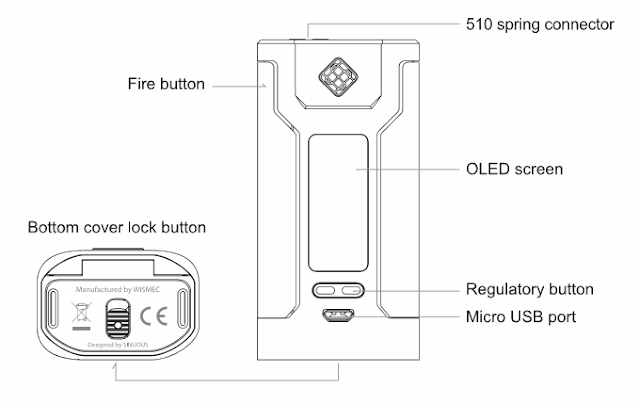 Imbalanced Alert: When the different between the maximum and minimum cell voltage is equal or greater than 0.3V, the OLED screen will display “IMBALANCED BATTERIES” after inserting the USB cable. Then please take out the cells to charge or replace with freshly charged cells. Chek USB Alert: When the voltage of the USB charger is equal or greater than 5.8V, the OLED screen will display “CHECK USB ADAPTER” after inserting the USB cable or vaping. Charge Error Alert: When no current is detected in charging stage, the OLED Screen will display “CHARGE ERROR”. 2. This products is not recommended for use by young people, non-smokers, pregnant or breast-feeding women, persons who are allergic/sensitive to nicotine. 2. Do not leave the product in high temperature or damp conditions, as this may damage the product. The appropriate operation temperature is within 0℃ to 45℃ while charging and -10℃ to 60℃ while in use.